Use for Meats to add in Stews, Soups, etc. Simply insert your food into the trays and hit the switch to activate a new and healthier level of food preparation. 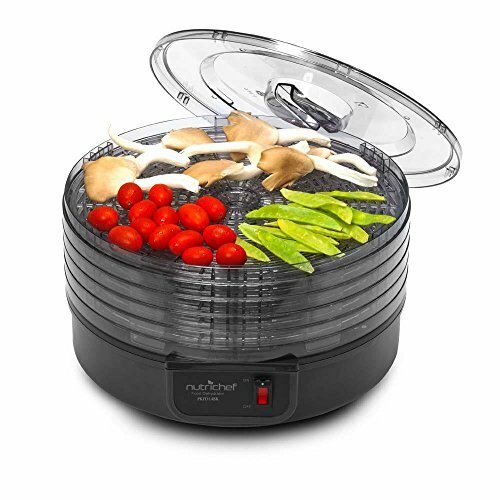 The NutriChef Kitchen Dehydrator effectively works to remove moisture, drying your food and reducing spoilage. The multi-level trays allow for enhanced air-flow that dehydrates for prolonged food shelf-life & preservation. Your food will last longer and the removal of moisture content is far more beneficial than canning or freezing. Dehydration with the NutriChef retains up to 97% of the food's nutritional value and is scientifically tested to reduce spoilage times -- and best of all, it will still tastes great! Once dried, your food will retain original vitamins, minerals and flavor! The simple one-touch button operation makes it even easier to prepare foods like meat, fish, poultry, fruits, vegetables and more! Save time, save money and save valuable cabinet space since the dehydration process shrinks your food, making it great for food storage or stocking up for the winter. It works great with a wide variety of food groups and is perfect for making healthy, oil-free veggie chips for the kids -- or hardy beef jerky for dad. Reduce spoilage and enjoy enhanced food preservation with the NutriChef Kitchen Dehydrator. Marna White Piggy Steamer, 8-1/2"